One night in the fall of 2005, Penn State alumnus Terry Pegula reached out to Joe Battista, the longtime coach of the university's club-level men's hockey team. Pegula was eager to know what was preventing his alma mater -- a seven-time national champion at the club level -- from competing at the NCAA Division I level. Battista had fielded this question too many times. Since arriving on campus as a student in 1978, the former team captain and passionate advocate of the "Penn State Icers" program had seen more than a dozen formal proposals fail to get the wheels in motion on a new arena project. "I explained to [Pegula] that we don't have a facility, we don't have the budget, there were Title IX issues and it would take a significant amount of money," Battista told NHL.com. "[Pegula] said, 'Look, I'm in town. I want to meet you for dinner.'" Seven years later, as Penn State opens its inaugural Division I men's ice hockey season Friday against American International at 32-year-old Greenberg Ice Pavilion, Battista could not be more thankful he accepted that unexpected dinner invitation. 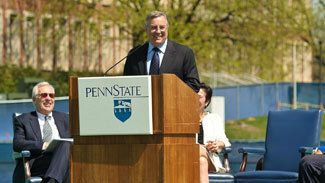 Pegula's generosity has forever changed hockey at Penn State. "Terry asked me [that night], 'What's it going to cost to make this happen?' I said we have to build a building, finance the scholarships -- minimum $50 million," Battista told NHL.com. "I figured that would end the conversation. He paused, rubbed his chin and said, 'I think I can do that.' I just about fell out of my chair." Battista returned home that evening and searched Pegula's name on his computer, finding he was the largest private owner of oil and gas wells east of the Mississippi River. Pegula sold his company, East Resources, for $4.7 billion in May 2010. That transaction made it possible for him and his wife, Kim, to make the largest private gift in Penn State history on Sept. 17 of that same year. 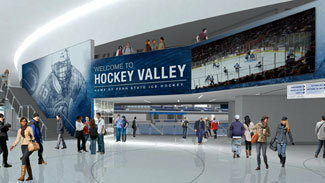 The donation -- initially announced as $88 million and later upgraded to $102 million -- established varsity men's and women's ice hockey programs at Penn State. The gift also financed Pegula Ice Arena, a 6,000-seat venue currently being built on the school's University Park campus. Still, the concept of a hockey-centric arena at Penn State feels like a dream to Battista, who is thrilled to be directing ice arena and hockey development within the school's athletic department as the program begins to take shape. "It's been a journey of faith, hope and perseverance," Battista told NHL.com. "The bottom line is that it took 32 years to happen, but dreams still can come true. There was never a moment when any of us actually thought this was going to happen until the Pegulas stepped forward." The ongoing arena construction, Battista says, is only about 40-percent complete, but the large-scale project already is coming to life. The towering development even leaves an impression on Penn State fans from the upper level of the school's 106,572-seat football stadium just down the road. Penn State men's hockey coach Guy Gadowsky said he can't keep his eyes off his program's future home. "Every time you drive by [the construction], it really gets your juices flowing," Gadowsky told NHL.com. "You get caught just staring at it and visualizing what it's going to be like and what this great student body is going to sound like inside. One of the visions of the Pegula family is to increase the level of hockey in Pennsylvania, and this is going to do it." As the Penn State program transitions from the club to varsity level this season before joining the Big Ten Conference in 2013-14, sophomore captain Tommy Olczyk made it clear his primary focus is to help his team set its on-ice identity in Year 1. That being said, Olczyk admitted he is hooked on the three-dimensional renderings and virtual tours of Pegula's plan for his future. "Technology has come so far that I can see myself on the ice [at Pegula Ice Arena] -- and it's only a short year away," the son of 2012 U.S. Hockey Hall of Fame inductee Eddie Olczyk told NHL.com. "This school has so much to offer, and Mr. Pegula was so very generous to donate all that money he did. Next year, moving to a state-of-the-art facility is going to make us appreciate everything that much more." And Pegula's hope is for student-athletes like Olczyk to be given an opportunity to compete and flourish at the highest level of college hockey in a facility suited for player development. "A program is only as strong as the student-athletes who chose to dedicate their time and talent to making it great," Pegula told the university's official news source at the ceremonial groundbreaking for the arena this April. "We hope that through these scholarships, Penn State will be able to build a team of rising hockey stars who will succeed athletically and academically at the university. We also want to make sure that these young people have a facility which will allow them to fulfill their potential and be the best possible representatives of the university and Penn State intercollegiate athletics." On top of boosting Penn State's recruiting profile, Pegula Ice Arena is expected do wonders for community involvement in ice-related activities. Battista said the addition of this multipurpose facility, which will feature two NHL-sized ice surfaces, will satisfy the region's existing need for more ice time. Battista added that the athletic department is already in negotiations to host the state high school playoffs, USA hockey events, Disney on Ice and figure skating competitions -- on top of men's and women's NCAA hockey games and a wealth of community learning and recreational opportunities. Simply put, the rink is expected to be one of the busiest buildings on campus. "Our goal is to literally have this facility open -- both sheets of ice -- from 6 a.m. until 1 or 2 a.m. at night, seven days a week, for 360 days a year," Battista told NHL.com. "It's not just about these two varsity hockey teams -- the economic impact of Pegula Ice Arena on this area will be significant." While the new arena should have a far-reaching effect on the Centre County region, Pegula hopes to boost the exposure of hockey throughout Pennsylvania. The program already has set the tone by scheduling an array of in-state games to establish its footprint. Last January, the Nittany Lions faced off against Neumann University at Citizens Bank Park, the site of the 2012 Bridgestone NHL Winter Classic. This season, the program will play at Philadelphia's Wells Fargo Center, Pittsburgh's Consol Energy Center and Wilkes-Barre's Mohegan Sun Arena. Pegula's goal of spreading the game of hockey isn't limited to Pennsylvania. His purchase of the Buffalo Sabres on Feb. 22, 2011 served as another example of his financial backing of the sport's growth in the Northeast region of the United States. "When [the Pegulas] bought the Sabres, it really sunk in to people that, 'Wow, these people are all about hockey,'" Battista said. "Terry's vision is for the state of Pennsylvania and the western New York area to become the next Massachusetts, Minnesota or Michigan. There is no greater ambassador for the growth of hockey in Pennsylvania and western New York."